Good-bye, rust-colored chalkboards! Over summer 2018, dust-covered Theatre Hall 316 was transformed into a collaborative learning space. Those who teach and learn in this room may structure it in multiple ways to foster learning and engagement — with or without the use of its state-of-the-art technology (further resources below). The first configuration, “Kerjasama,” is for classes in which groups of students work directly with the technology. The room allows groups of six to organize around a computer and screen. Instructors and students will have access to 6 computers with LCD screens, and one computer with access to the projector & screen. The use of a matrix will allow them to share one screen across all, or to allow for each of the seven computers to display on a given screen at the same time. Student groups may choose to use the installed computer associated with their group or they may connect their own devices to their group’s LCD screen using an HDMI or VGA cable. Kerjasama means cooperation, teamwork, and collaboration in Indonesian. The second configuration, “Le Bistro,” allows for groups of four students to engage in group work and discussion without the distraction of technology but with the flexibility to use their own devices if needed. Le Bistro is named for the configuration’s resembling bistro tables. Pods make for high engagement, low tech, group work. For those interested in creating a seminar-style classroom, “the Volksregering” configuration allows students and instructors to engage in conversation as a whole group. A number of tables can be removed from the square configuration for smaller seminars. For days in which students or instructors wish to lead the class in a presentation, the class will likely want to use the “Darlith” configuration. This layout allows students to congregate around the main screen and projector, and for one speaker to take center-stage. Darlith means lecture or oral presentation in Welsh. This setup works well for more “traditional” lecture formats. Those leading discussion may wish to use the small, movable lectern that’s large enough to hold a wireless keyboard, mouse, and a drink. 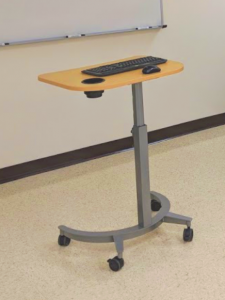 This small podium can easily move around the room. Instructors assigned to this room who are looking for some guidance and support in it’s use, please know that the Center is here to help! If you need help navigating the technology, reach out to the Help Desk at 920-465-2309 or helpdesk@uwgb.edu. Wish to explore research-based best practices on your own? “Check-out” any of the following readings that support active learning activities and philosophies. Barkley, Elizabeth F., and Claire H. Major. Learning Assessment Techniques, edited by Elizabeth F. Barkley, and Claire H. Major, John Wiley & Sons, Incorporated, 2015. ProQuest Ebook Central, https://ebookcentral.proquest.com/lib/uwgb/detail.action?docID=4205832. Barkley, Elizabeth F., Patricia K. Cross, and K. Patricia Cross. Collaborative Learning Techniques, edited by Elizabeth F. Barkley, et al., John Wiley & Sons, Incorporated, 2014. ProQuest Ebook Central, https://ebookcentral.proquest.com/lib/uwgb/detail.action?docID=1745058. Brookfield, Stephen D., and Stephen Preskill. The Discussion Book: 50 Great Ways to Get People Talking, John Wiley & Sons, Incorporated, 2015. ProQuest Ebook Central, https://ebookcentral.proquest.com/lib/uwgb/detail.action?docID=4306433. Lang, James M. Small Teaching: Everyday Lessons from the Science of Learning, John Wiley & Sons, Incorporated, 2016. ProQuest Ebook Central, https://ebookcentral.proquest.com/lib/uwgb/detail.action?docID=4455000. Sibley, Jim, and Pete Ostafichuk. Getting Started With Team-Based Learning, Stylus Publishing, 2014. ProQuest Ebook Central, https://ebookcentral.proquest.com/lib/uwgb/detail.action?docID=3037637. Team-Based Learning in the Social Sciences and Humanities:Group Work that Works to Generate Critical Thinking and Engagement, edited by Michael Sweet, and Larry K. Michaelsen, Stylus Publishing, 2012. ProQuest Ebook Central, https://ebookcentral.proquest.com/lib/uwgb/detail.action?docID=894670.